32 The waiters served Joseph at his own table, and his brothers were served at a separate table. 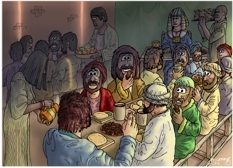 The Egyptians who ate with Joseph sat at their own table, because Egyptians despise Hebrews and refuse to eat with them. 33 Joseph told each of his brothers where to sit, and to their amazement, he seated them according to age, from oldest to youngest. 34 And Joseph filled their plates with food from his own table, giving Benjamin five times as much as he gave the others. So they feasted and drank freely with him. Verse 16 tells us Joseph’s feast was to take place at noon. This scene is set inside. The strong Egyptian sunlight is being screened by unseen cloth drapes, held high above the heads of the people. You can see two strips of sunlight running down the back wall, where the screen edges don’t quite overlap. Background – from left to right: a group of 5 un-named Egyptian guests, eating together at a bench table. They are about to be served by a male servant carrying a bowl of fruit. Foreground from left to right: Reuben is at the head of the table (with his back to us) being served a drink by a female servant. The man in red robes is Simeon, with Levi opposite him, in pale colours. Next to Simeon is Judah. Opposite him is Dan, in green. To Judah’s left is Naphtali, sitting opposite is Gad, with Asher to Naphtali’s left. Opposite him is Issachar. 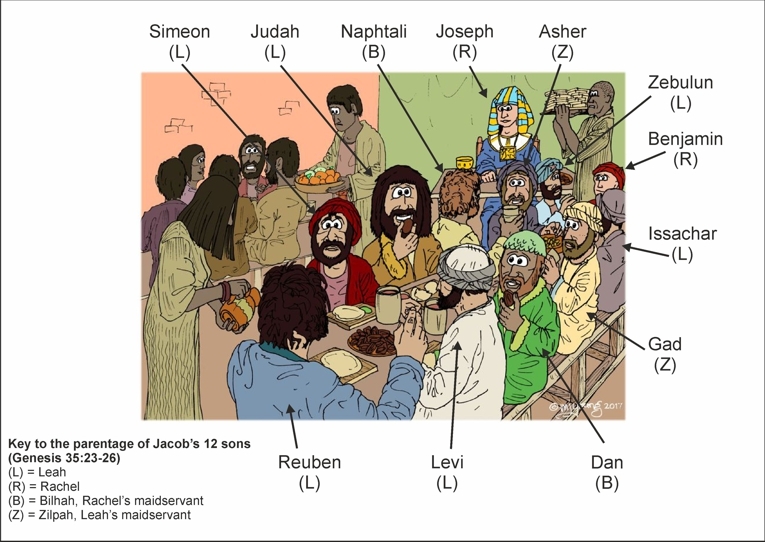 Zebulun is sitting talking to Benjamin, who is the little man in red at the end of the table. Joseph is sitting in rich Egyptian clothing, on his own table, behind the brother’s bench table. He is being served by a man who appears to be carrying toast! 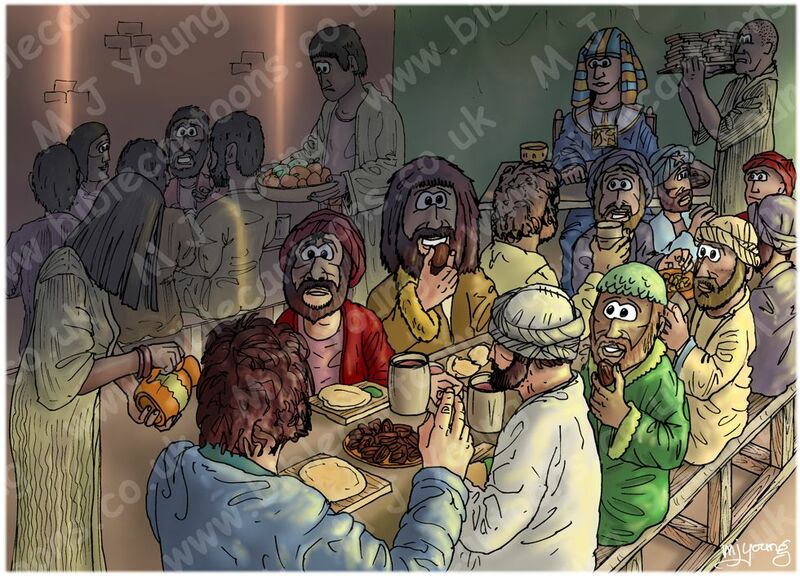 01) (Previous page) Genesis 43 – Joseph’s feast – Scene 05 – Benjamin’s portion (Colour version). 02) (This page) Genesis 43 – Joseph’s feast – Scene 05 – Benjamin’s portion (Shadow version) In this version I have made dark shadows cover much of the scene, with strong sunlight illuminating the brother’s on the foreground table. This scene took quite a long time to draw & colour, because of the number of figures it contains. I have created character sheets with notes of all the brother’s features & colours, so as to maintain continuity between scenes. Jacob’s sons – Benjamin’s portion – Who’s who? !